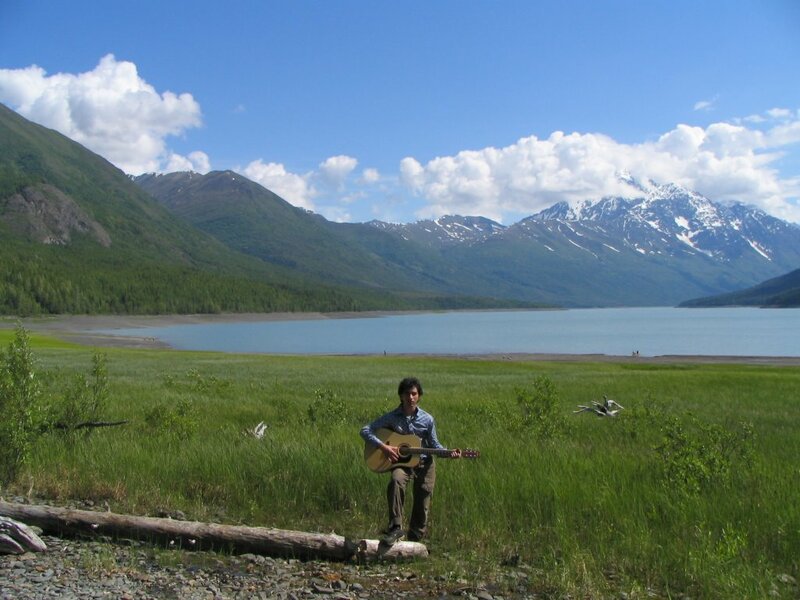 To all those who were wondering what I've been up to, or why I have not posted the promised update of my Alaskan adventures, allow me to offer an explanation. My grandmother from Germany has been visiting us for the last two weeks, so I have been spending much of my time with her. She also bought me a beautiful Washburn guitar, which I have been dutifully learning to play (a couple hours a day) for the last three or four weeks. I now know about ten songs for which I can decently do guitar chord backing (for singing), including Hebrew, Russian, and English music. I am very much in love with the instrument! 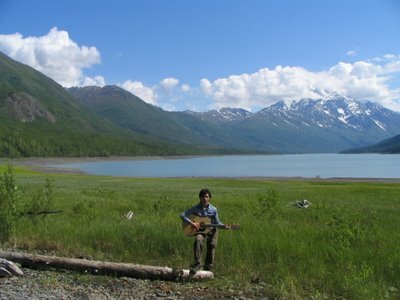 When my family and my grandmother went to visit the beautiful Eklutna Lake, I took the guitar with me and spent a good 2-3 hours serenading my grandmother, my dogs, and the plentiful mosquitoes. A Frisbee player's made outa muscle 'n blood. And a mind that sharp, and a back that's strong. You play sixteen games, an' whaddya get? Another day sorer an' more drenched in sweat. I sold my soul to the Ultimate Game. A lotta men didn't -- a lotta man died. If the right one won't block you then the left one will. Played till my fingers were too numb to feel pain. Ain't no person gonna tell me that Frisbee's a joke. I might fall and miss, but the game will go on. If I die, may I reincarnate as a disk! For the record, feel free to comment on this -- or any other -- of my blog posts. I'd love to hear back from you! you are an amazing individual. I must say that i am rather jealous of you with your multifaceted talents. I tried to learn guitar a few years back and never had the determination to practice. Keep on learning, my friend. Are you bringing your washburn to school with you? (you should.) I recognize your feeling when you invited everyone to comment on your blog. I feel the same way about my blog. No one leaves comments for me. (hint, hint.) a-hem. see you in august! p.s. do i really need to prove i am a human every time i want to comment on your blog? do you really think you are going to get that much spam? remind me why you allow corporations to litter your blog with distasteful advertisements? What did they promise you? Lovely song. The joy I felt in reading it just erased the bad week I had. By the way, how is the Half Blood Prince? I love the parody! 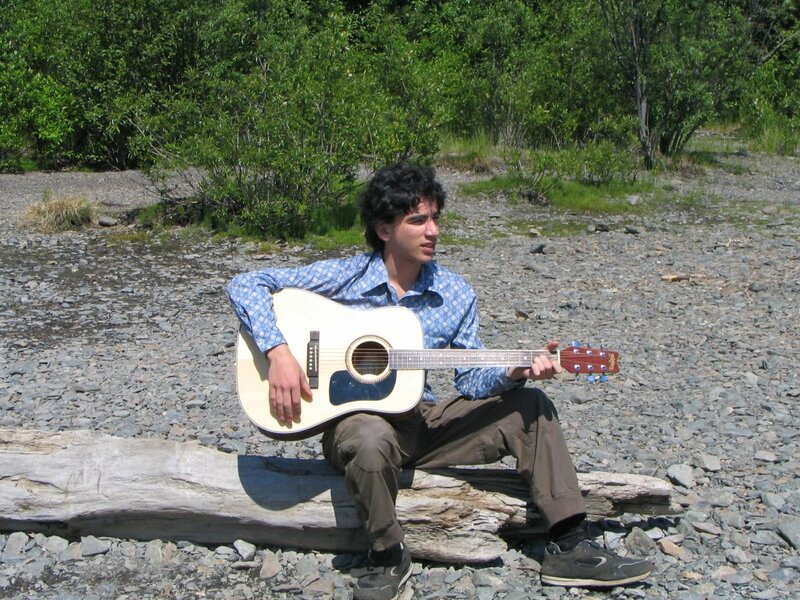 And three cheers for learning guitar- and after you've mastered that you can move onto the igil or the tro or the gusla or some other more practical instrument.